> Dell EMC > SDS in the Data Center: Are You Ready? Much like server virtualization before it, software-defined storage—de-coupling storage software and hardware—promises to unlock unprecedented agility and efficiency for organizations. Organizations considering SDS can ensure the best outcomes, today and tomorrow, by keeping their own current requirements in mind while adopting a sound strategy for future-readiness. 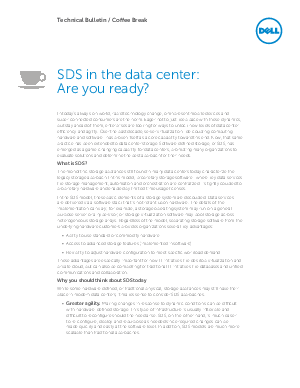 Download this whitepaper to learn more about the advantages of SDS in the Data Center.